$18,000 in awards granted to-date! Parents who have an interest in improving and assisting the athletic program at Monte Vista High School. MVAB's primary purpose is fund-raising, capital improvement project leadership, student-athlete scholarships, and operational input in support of the entire spectrum of athletic programs at Monte Vista. Our team Liaisons also serve as a direct link between the organization and each individual team. Learn More. MVAB Scholarship Applications are Available! 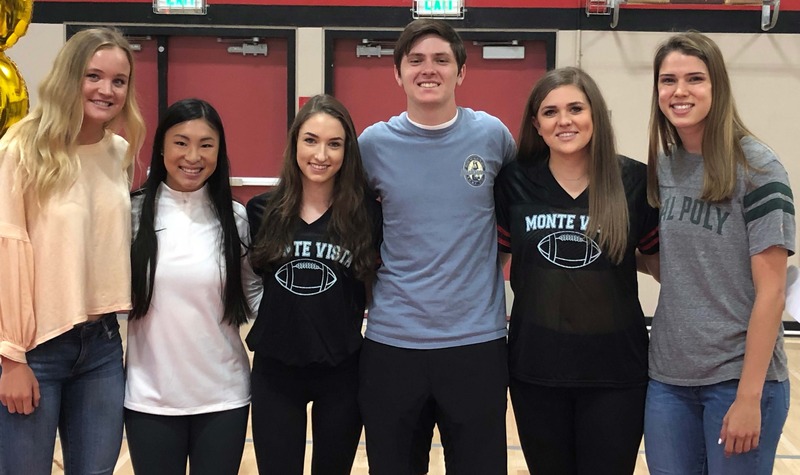 Six $1,000 scholarships for graduating Seniors are awarded by Monte Vista Athletic Boosters annually to 3 girls and 3 boys. Applications are now available! Deadline is Monday April 8, 2019. Read more HERE. MVAB Crab Feed 2019 is coming! Join other Monte Vista Athletics fans on Saturday March 23, 2019, for the annual MVAB Crab Feed! Great crab. pasta, salad, silent auction and more! Adults 21+ only. This event sells out every year, so get your tickets as soon as possible! Only $65 per person or buy full Team Tables of 8 for $520. Click HERE for more info. Sports teams: Banner sponsorships are one of the BEST ways to raise funds for your team. Know anyone with a business that they would like to promote? It's only $500 for a full year sponsorship, with net proceeds of about $425 going back to your team! A great way to promote a business and support MV Athletics at the same time. Start anytime! Banners run a full year, no matter when you start your sponsorship! Learn more HERE. Your purchase of a MVAB membership includes VIP cards that get you admission to all home football and basketball games (excluding playoffs/tournaments), and up to $100 of the purchase price goes directly to the team of your choice! Get more info HERE!